Europa Clipper, as it is tentatively being called, is a solar-powered spacecraft which will orbit Jupiter, but make 45 close flybys of Europa over three years, at altitudes ranging from 25 kilometres to 2,700 kilometres (16 miles to 1,700 miles). The instrument payload includes high-resolution cameras and spectrometers, ice-penetrating radar, and a magnetometer. The spacecraft will also look for the elusive plumes of water vapor first tentatively seen by the Hubble Space Telescope in 2012. 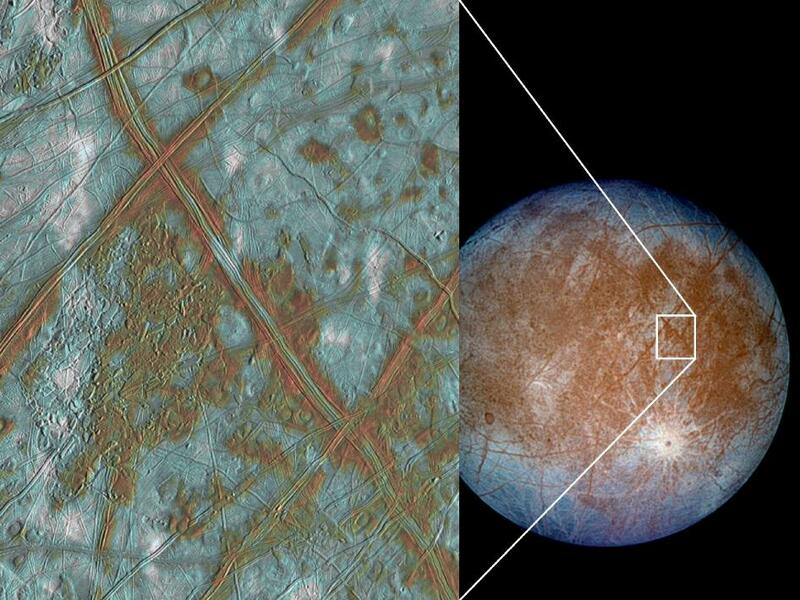 The brownish “smudges” on Europa’s surface are another prime target of study, as they are thought to be places where water from below has reached the surface through the many cracks in the ice shell, depositing minerals or other material. Regions of “chaotic terrain,” where the ice has been broken and jumbled like pieces of a jigsaw puzzle, are also thought to likely be directly over subsurface hydrothermal vents on the ocean floor. Such vents in Earth’s oceans are oases of a wide variety of life forms. 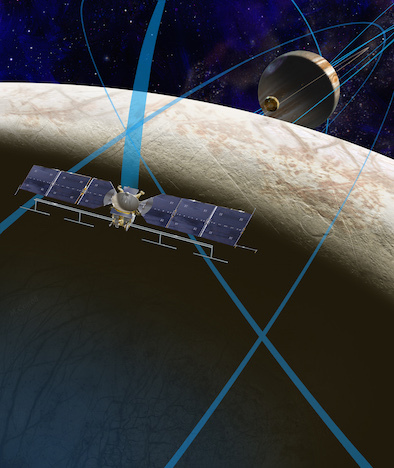 Interior Characterization of Europa using Magnetometry (ICEMAG) – principal investigator Dr. Carol Raymond of NASA’s Jet Propulsion Laboratory (JPL), Pasadena, Calif. This magnetometer will measure the magnetic field near Europa and, in conjunction with the PIMS instrument, infer the location, thickness and salinity of Europa’s subsurface ocean using multi-frequency electromagnetic sounding.